It's not about being noble or politically correct - just good business sense. In fact, retaining the experienced woman employee has evolved to be at the heart of gender diversity efforts of companies across industries. The reasons are not hard to find. Swati Agarwal, 38, is a typical working woman. A director with PricewaterhouseCoopers (PwC) India, she reaches office at 9 am every morning, does her bit for the company - where she looks after corporate strategy - and then heads home to family. There's a small twist, though - she works part-time, having availed the company's "reduced hours" policy. After six hours at work, she is back home around 3 pm to receive her children - a son aged 10 and a daughter aged six - from school. Her salary and leaves are proportionate to the hours she spends at work, but she is content. "The good thing is that it (part-time work) does not affect your ratings or the kind of roles you are playing," says Agarwal. "In the past three years I've played three meaty roles, and this policy has not been a dampening factor." What PwC India has effectively done is retain Agarwal - a 10-year veteran - by helping her strike the right balance between office and home. In fact, retaining the experienced woman employee has evolved to be at the heart of gender diversity efforts of companies across industries. The reasons are not hard to find. One, companies realise that replacing a highly skilled, dedicated and experienced woman executive with a less able man who will put in full hours does not make much sense. Two, women are excellent multi-taskers who excel in a number of areas. And three, put simply, is cost - of replacing an experienced hand, and also because employability of fresh graduates from universities is an issue. "Cost is not only in terms of money but in terms of time for a new employee to ramp up to the job," says Sandeep Kohli, National Director-HR, Ernst & Young (EY) India. Adds Jagjit Singh, Chief People Officer of PwC India: "Not more than 10-15 per cent (of fresh graduates) is actually employable. So the question is: why don't I spend that much on my own people so that I can retain them?" Gender diversity policies have evolved over the years, even as Indian companies have spread their wings to foreign shores, and younger and younger generations of people - with divergent views and approaches to work - have joined the workforce. Today, therefore, no company needs a specific trigger to conceptualise a new policy - they are being designed constantly, on the run. Most companies agree that the need to have a diverse workforce stems from the fact that their customer base itself is diverse. Sumit Mitra, Head, Group HR and Corporate Services, Godrej Industries Limited and Associate Companies, says: "We are in the business of serving consumers, who are a diverse set of people with almost equal representation of all genders. So, to understand those genders better, we must have a diverse workforce." Diversity, Mitra explains, is not only about male and female, but also about the LGBT (lesbian, gay, bisexual, transgender) community. Diversity also engenders greater innovation, points out Rohit Thakur, Head of HR at Microsoft India: "Creating an inclusive environment helps attract and retain talented employees, which results in more innovative products and solutions for our customers." No wonder the Tata Group, with 600,000 employees worldwide, of which more than 145,000 are women, wants to have 230,000 women employees by 2020. "Diversity is an economic imperative, not just a social cause," says N.S. Rajan, Member-Group Executive Council and Group CHRO of Tata Sons, the Groups holding company. Fallout of this realisation: companies have been innovating in terms of their HR policies to help them retain women employees. For example, most companies look to go much beyond the statutory maternity leave of 12 weeks (about three months) as per the Maternity Benefit Act, 1962. Godrej Industries offers six months of maternity leave with another six months of flexi time; PwC India also offers six months of maternity leave; Tata Sons offers seven months of paid maternity leave and 15 days of paid paternity leave; Bangalore-based engineering services major Cyient, too, offers six months of full-pay maternity leave and an additional six months off for child care, during which they get half pay, according to B.V.R. Mohan Reddy, Founder and Executive Chairman of the company. IBM India offers three months maternity leave, plus one month extra paid leave if needed, subsidised by its global work/life fund. "Obviously it does not affect the business P&L because this is over and above that," says D.P. Singh, Vice President-HR (India/South Asia), IBM. Diversity initiatives have moved beyond hygiene stuff like maternity leave, extended leaves, crèches, day care facilities, etc. Companies are now going beyond in their quest to retain - and even bring back - experienced talent. EY India allows women employees who leave for childbirth to return within five years, no questions asked. "Basically you have a lien on the job for five years - same position, and salary will be the current salary at that time," says Kohli. That also means the returning employee - and even the part-timer - loses out on seniority and growth. "They are not very worried if growth is a bit slower, because they understand if they are working flexible times, they will not," says PwC's Jagjit Singh. "They just want meaningful work." IT bellwether TCS, which has 353,000-plus employees including more than 100,000 women, ensures women who are away from work for an extended period are kept updated on company developments, taught new technologies, and are assigned senior advisors three months before they return to make their transition smooth. "The expectation that women have today is more leadership opportunities, growth opportunities, developmental opportunities," says Ritu Anand, Deputy Head-HR of TCS. "It is a global phenomenon." The question is: are Indian companies' interventions working? Going by the fact that these companies have a fair share of women in their workforce, the answer appears to be yes - TCS has 35 per cent; Tata Group, 24 per cent; Godrej, 30 per cent; EY, 41 per cent; PwC, 33 per cent; IBM, 30 per cent. And the numbers are rising. Anand informs that TCS's share of women has gone up from 30 per cent to 35 per cent in about five years. But things are not so straightforward. An ex-employee of one of these companies that BT spoke to said she was denied the one-month teleworking facility the company gives to its employees after returning from maternity leave. She said: "My boss just said I couldn't take it, and that was it." She added that hers was a one-off case and she did see other colleagues availing it. "I didn't raise it to HR but it certainly was a trigger for me to leave the company." This might be an exceptional case, but it seems to be a microcosm of the problems companies face. A company can have right policies, but managers play an important role to ensure they are followed in spirit too. Nirmala Menon of diversity and inclusiveness solutions company Interweave Consulting says implementation is always an issue. Even now a lot of managers see their women team members going on leave as an aberration, a favour and a privilege. This shouldn't be the case. Moreover, maternity leave is not something that is immediate but is known well in advance for companies to be able to plan, she says. She suggests that education plays a very important role here, which can be done through workshops. Also, to ensure accountability, companies can do regular inclusion audits of women who availed the maternity leave to check how they are placed in the company, she adds. The Indian government announced last year that it would increase paid maternity leave in private firms from 12 weeks to 26 weeks, though it is yet to do so. The UK offers 39 weeks of paid leave. In the US, women can avail 12 weeks of maternity leave, but the employers are not obliged to pay anything. Indisputably, there is a long way to go yet. 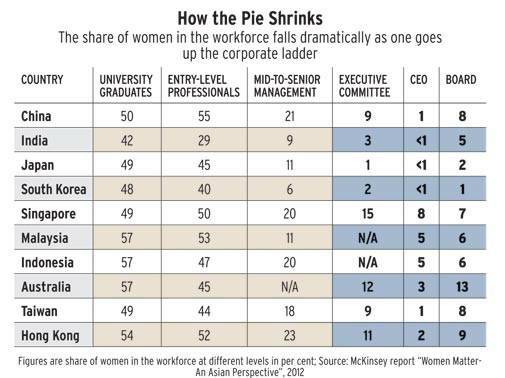 A study by McKinsey points to the fact that women's share of the workforce in India falls dramatically as one goes up the corporate ladder. Restricting that fall can have immense benefits. A Korn Ferry-National University of Singapore study says companies with more women on boards show better return on equity and return on assets (see charts). Another study by McKinsey says that if India bridges its gender gap in the workplace, its annual GDP could increase by $2.9 trillion in 2025. Says Anu Madgavkar, a co-author of the last report and Partner, McKinsey Global Institute: "There has to be commitment from top leadership - the CEO has to be personally committed to driving this agenda. Leadership really matters in this, and we've seen this globally." India Inc. has its work cut out.